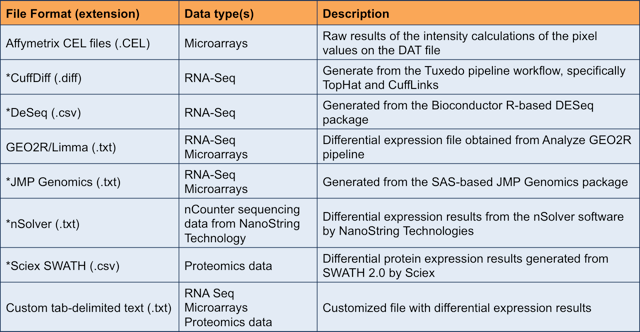 2. iPathwayGuide accepts several file formats for RNA-Seq, microarrays, and proteomic profiling. Refer to the full list of accepted data formats on the next page. 3. Submit the entire list of genes, not just the significant genes. This is important because we need to calculate the background to provide you with a comprehensive analysis of your data without false positives. 4. You will have the opportunity to customize thresholds for the significant genes after you upload. 5. Each dataset takes about 15 minutes to analyze. You will get an automated email as soon as your analysis is complete. 6. Don’t have your data ready? We have sample datasets available for each data format. Grab a sample file and try it… it’s easy! 7. Uploading data is easy. Here are two quick video tutorials on how to upload data. The differential expression data can yield insights on potential diseases enriched in the sample data. Such conclusions can be drawn by observing the number of differentially expressed genes or proteins in your data. One such computational approach is described below. iPathwayGuide provides a comprehensive analysis of differential gene/ protein expression data that includes disease analysis. For each disease, the number of differentially expressed (DE) genes annotated to it is compared to the number of genes expected just by chance. iPathwayGuide uses an over-representation approach to compute statistical significance of observing more than the given number of DE genes. The p-value is computed using the hypergeometric distribution that can be corrected using False Discovery Rate or Bonferroni method. Register for iPathwayGuide today and try this feature for free. Gene Ontology (GO) is a dynamic, structured, precisely defined, controlled vocabulary used to describe the roles of genes and gene products along with their hierarchical structure in any organism. Although the key objective of GO project is to unify the representation of genes and gene product attributes across the species gene ontologies are particularly useful to identify enriched GO terms based on the DEGs using enrichment analysis. Since ontologies have a hierarchical relationships, it is important to apply appropriate correction factors to minimize errors. For instance, Using a False Discovery Rate (FDR) or Family-wise Error Rate correction factor may not be appropriate for GO analysis. Advanced pruning methods like Elim and Weight as proposed by Alexa et al (2006) are more suited for such analysis. You can lean more about different correction factors in Chapter 16 of this book. Advaita has teamed up with SCIEX, the leader in Data Independent Acquisition (DIA) Mass Spectrometry for the collection and analysis of proteomics-based data. Through this collaboration, users can now bring their SWATH data from the SCIEX protein expression workflow and analyze it in the context of pathways, gene ontologies, microRNAs, and diseases. The power of iPathwayGuide allows you to combine protein expression experiments and contrast them with other platforms including RNA-Seq, microarrays, and targeted panels. Watch the video below to see how SCIEX SWATH proteomics data was juxtaposed to mRNA data from an RNA-Seq experiment. Affymetrix microarrays are one of the most widely used gene expression platforms in the industry. iPathwayGuide supports the most common platforms. Look at the FAQ for the latest list of supported platforms. The resulting file from an Affymetrix microarray is commonly known as a CEL file because of the CEL extension place on the file name. To upload your CEL files, simply drag and drop the corresponding files for the condition group and the control group. iPathwayGuide requires at least 3 – unique files for each group. We recommend at least 4 per group in case one of the samples is rejected during QC and normalization. Once your files are identified, click upload to begin the process. iPathwayGuide will upload your files, QC check them, reject and highlight any that do not pass, normalize the files, and calculate differential expression. Depending on the number of files, this process can take 2 to 5 minutes or more. Once the QC metrics are available, iPathwayGuide will present the QC stats, QC Density Box Plot, and QC Density Plot. Any samples identified for removal will be highlighted in red. Once the Normalization is complete, iPathwayGuide will present the Normalized Box Plots and the Normalized Density Plot. If you wish to include any of these graphs in a paper or report, you can download the graphs using the download button. If you are satisfied, you may proceed to the Contrasts Intake page to set the number of significant differentially expressed genes along with title and description of the report.